‘An armrest was omitted in order to leave the body more freedom in movement and to allow it to bend forward or to turn to the other side unrestricted’. 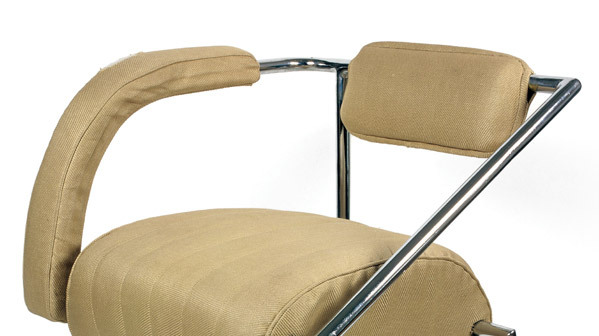 So said Eileen Gray of what she called her ‘nonconformist chair’. Or, as Zeev Arum, the furniture dealer who revived many of Gray’s startling designs in the 1970s, put it ‘you don’t need to sit like an emperor to be comfortable’. The chair contains many of the notions at the heart of the Modernist movement in Europe: freedom, individuality, the belief that the form of an object should be determined by its function, the use of industrial materials like tubular steel and aluminium. That its creator was one of the movement’s pioneers yet virtually unknown in her native country for most of her life says a great deal about Ireland’s ambiguous relationship to European modernity. Eileen Gray was born in 1878 at Brownswood, near Enniscorthy, Co. Wexford. She studied painting at the Slade School of Art and then in Paris, where she became interested in particular in Japanese lacquer work. In 1917, Gray was commissioned to design the interior of an apartment on Rue de Lota in Paris. She created strikingly innovative objects, including a boat-shaped ‘pirogue’ sofa and the voluptuous leather and tubular steel ‘bibendum’ chair that became a much-reproduced twentieth-century design classic. The Romanianborn architecture critic Jean Badovici wrote that ‘Eileen Gray occupies the centre of the modern movement. She knows that our time, with its new possibilities of living, necessitates new ways of feeling’. Badovici and Gray collaborated on a stark Modernist house, called E-1027, at Roquebrune near Monaco. She also designed the furniture, including the small, circular, adjustable E-1027 table that is also endlessly copied. Gray was far from the only Irish artist at the cutting edge of cultural innovation in Europe. Her contemporary in Paris, James Joyce, was a leading figure of literary Modernism. Yet independent Ireland as a whole struggled to assert a place in the invention of a new European identity. Isolation from the turmoil of contemporary Europe, a tendency to locate national identity only in the rural past, the lack of a dynamic industrial base, a strong relationship with the United States and state censorship all contributed to the failure to develop a strong European identity. It was not until the late 1950s that tentative official efforts to rethink the relationship with Europe began; even then the idea of joining the then six-member European Economic Community was largely shaped by the reality that Britain was attempting to do so. As it happened, the process was tortuous: Ireland eventually joined on 1 January 1973. Initially, for most of those who voted in a referendum to join the EEC, the main attraction was undoubtedly economic. It took many years before it became clear that Europe might also provide an imaginative space in which the claustrophobic conundrums of Irish (and British) identity might be re-envisaged. The embrace of Eileen Gray as an important Irish artist was a tiny but telling aspect of that shift. The Irish state acquired Gray’s personal collection and her archive on behalf of the Irish people in 2002; it was brought back to Ireland through the efforts of Pat Wallace, former director of the National Museum, and the minister at the time, Síle de Valera.